With readings and lectures by Aleksandar Hemon, Marcel Beyer, Mikhail Shishkin, and Filip Springer. 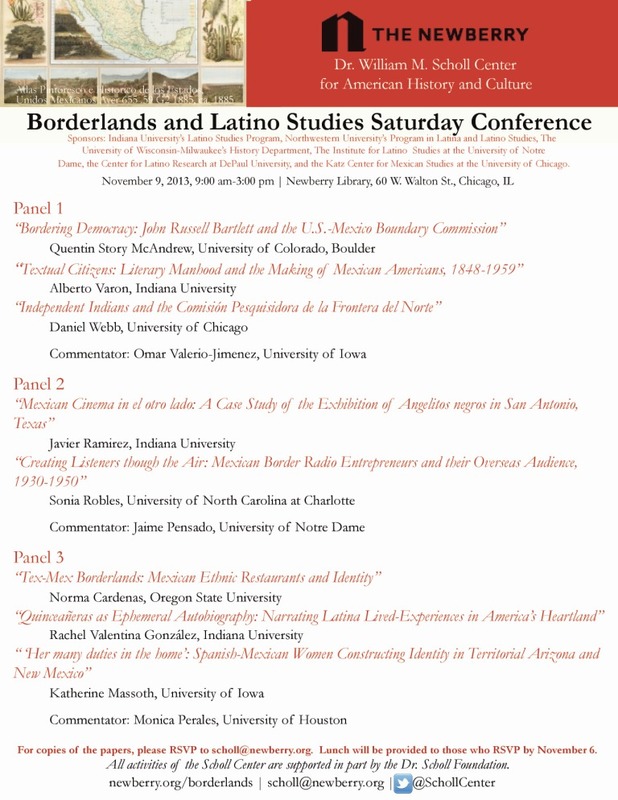 The conference will take place at the Goethe-Institut Chicago on Thursday, November 7, 2013 and at UIC (Hull-House Museum) on Friday, November 8, 2013. At the dawn of the twenty-first century, the relationship among identity, language and location has become more complex due to the increased mobility of individuals and groups, as well as the rise of virtual communities in the cyber sphere. We live in an age of global economic and cultural trends, displacement and dispersal of ethnic groups, and shifting political borders. Rapidly and frequently traversing territorial boundaries, displaced individuals serve as transnational cross-pollinators of culture and scramble nation-bound conceptions of identity. These phenomena complicate the ways we categorize, study, and consume literature; disrupt the criteria we use to delineate literary canons; and call into question the very notion of “national literature.” Nowhere are these questions of nation and national literature more germane than in the former Soviet bloc. The cataclysmic changes brought on by the economic and cultural restructurings, known as Perestroika and Glasnost’, challenged the role of geographic and political boundaries in defining so-called national literatures. This conference brings together contemporary writers from Central and Eastern Europe and scholars who study their work to interrogate the concept of national literature in the years after 1989 when national identity was and continues to be increasingly destabilized. UIC Department of Slavic and Baltic Languages and Literatures. “Radical Empiricism Revisited” stages a major invention in contemporary theory, by grouping together work around Deleuze, Latour, Luhmann and others as a form of empiricism inflected by Kant, and contrasting this to a more innovative and experimental relation to the absolute found in Derrida and the early Foucault. My treatment is an outgrowth of possibilities opened up by my current project, Historicity and Holism (parts of which have appeared or about to appear in differences and diacritics), as well as those I explored in my previous two books on Derrida and phenomenology, history of science, and philosophy of language. Among strong nation-states with wealthy economies and viable democracies, the distinction between citizenship and alienage is a foundational institution—indeed, the “institution of institutions” as Etienné Balibar names it. Of late both in the EU and the United States, the rights of unauthorized immigrants as persons, despite not being citizens, has been hotly argued. United States Supreme Court decisions have granted rights in some contexts, usually on the basis of personhood claims established in the Fourteenth Amendment, but denied them in other contexts. This paper is interested in the conceptual distinctions between citizenship and personhood, and will examine another conception, presence, that has remained latent in U.S. political and legal theory since at least 1790. Ralph Cintron holds a joint appointment in English and Latin American and Latino Studies at UIC. His research and teaching interests are in rhetorical studies; ethnography; urban theory; social theory; and transnationalism and immigration. He has been a Rockefeller Foundation Fellow. In 2007-2008 he was a Fulbright Scholar on the political science faculty at the University of Prishtina in Prishtina, Kosova. He was a former member of the Executive Board of the Rhetoric Society of America. Angels’ Town: Chero Ways, Gang Life, and Rhetorics of the Everyday won honourable mention for the Victor Turner Prize for Ethnographic Writing from the American Anthropological Association. In addition, he is associated with the International Rhetoric Culture Project, which brings anthropologists and rhetoricians together, and is co-editing for Berghan Press its 5th volume: Power, Rhetoric, and Political Culture: The Texture of Political Life. 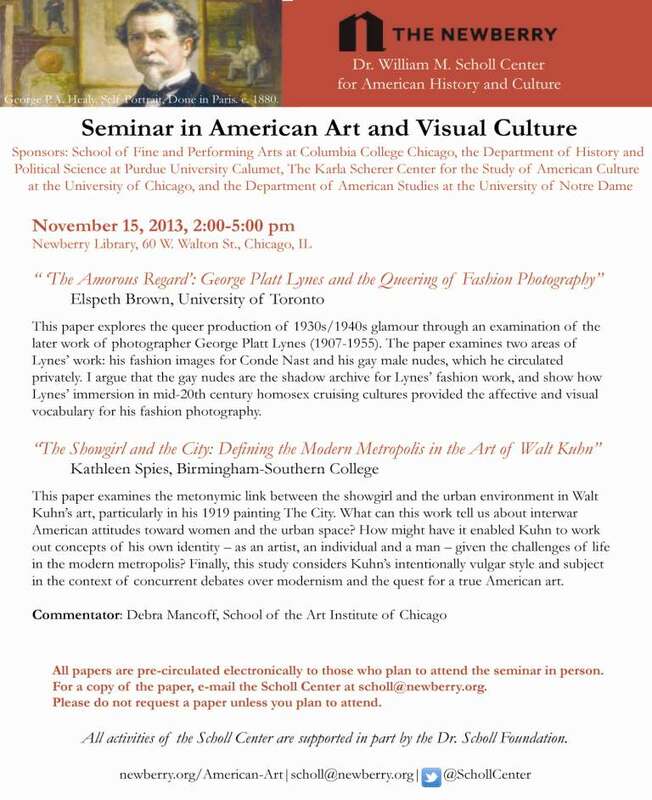 For additional information please contact 312-996-6352 or huminst@uic.edu. 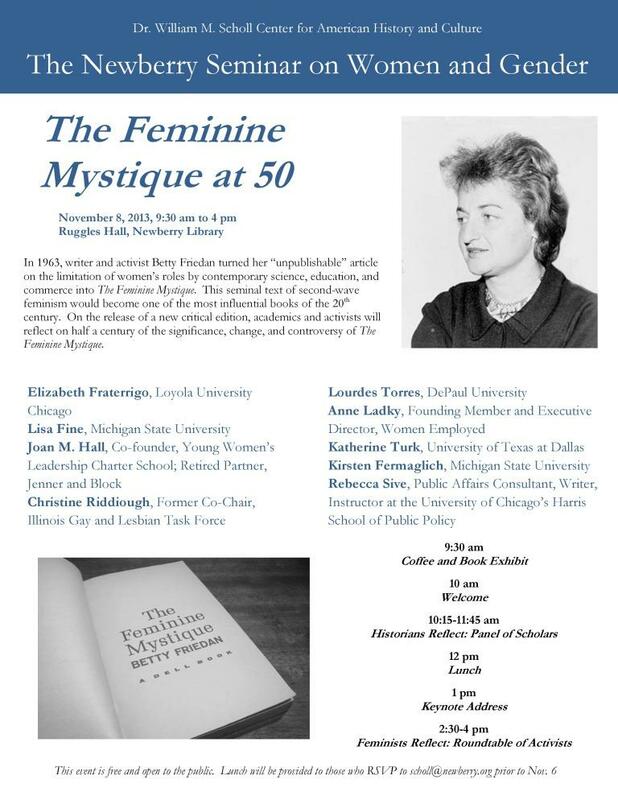 Newberry Seminar on Women and Gender: The Feminine Mystique at 50.
contexts: transgender identity, racial passing, and cultural appropriation. 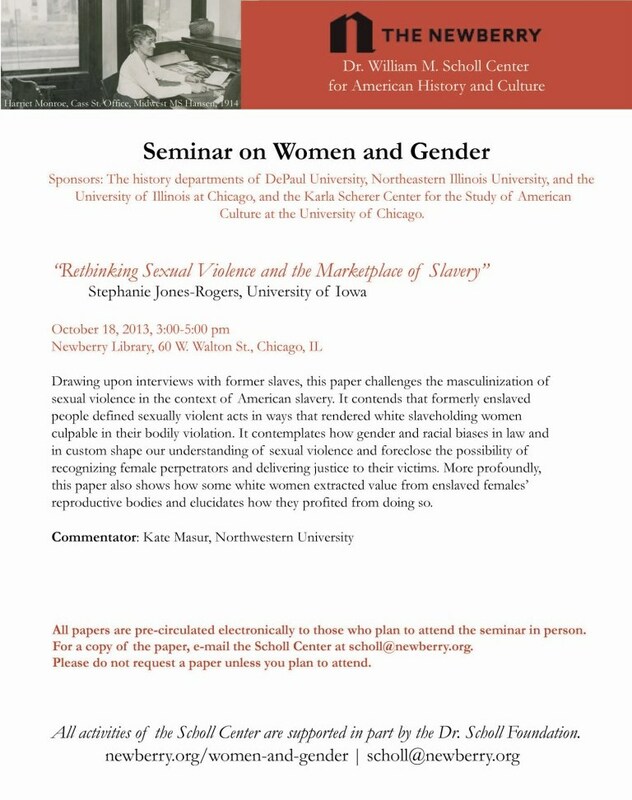 This talk reflects work in progress — dialogue is encouraged & appreciated! Bring a lunch–we’ll provide the beverages! Everyone is welcome! InterCcECT is the Inter Chicago Circle for Experimental Critical Theory. Contact us to announce or propose events, and check out our calendar for action all over town.